was accepted as part of RSC Open Stages 2017! In 2011, The Royal Shakespeare Company, the world’s leading performers of Shakespeare, launched their Open Stages project, to engage with and celebrate the world of amateur theatre. This involved working with a selected number of amateur groups, with a view to developing their skills and sharing ideas and good practice. 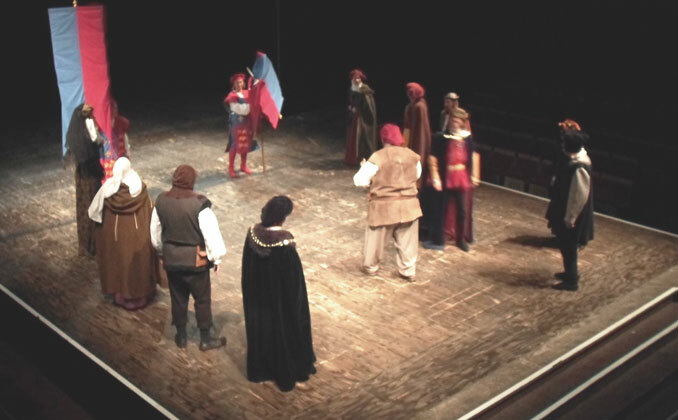 The Cotswold Arcadians’ production of Macbeth was chosen to participate in the first phase of the project. That allowed a number of us to attend workshops in Stratford run by RSC practitioners, and to perform extracts from our production on the stage at the Courtyard Theatre as part of a showcase evening. In 2013, the RSC announced the next phase of Open Stages, with a more intensive programme of support and coaching to a smaller number of participants. Our production of Falstaff was one of only 20 selected for the Stratford-based programme. This meant that the director and a number of our backstage team were able to attend workshops at Stratford, and that practically all members of the cast were able to participate in workshops at Stratford, led by RSC specialist practitioners in Voice, Movement, Acting and Combat. This phase also culminated in a regional showcase at the Courtyard Theatre, from which the Cotswold Arcadians were chosen to represent the region at a national showcase on the Royal Shakespeare Theatre stage. In recognition of their confidence in the amateur theatre, the RSC will be including groups of amateurs as the “mechanicals” in their 2016 production of A Midsummer Night’s Dream. Having successfully negotiated the early rounds of the process, the Cotswold Arcadians team were ultimately runners-up in the final selection weekend. We are privileged indeed to have been given the opportunity to tread the boards of the Stratford stages – and to learn from the top professionals in the field, who have generously shared with us the very latest thinking in stagecraft and technique. The whole project has been a thrilling and educative experience, and we are indebted to the RSC for their openness, their support and their teaching. Following a vote by the directors of all the productions represented at the regional showcase in December, our production of Falstaff was selected to represent the Midlands region at the national showcase. So, on Sunday 9th August, 18 Arcadians returned to Stratford to perform an extract on the stage of the Royal Shakespeare Theatre, with the magnificent Othello set as the backdrop, in front of a large and appreciative audience, alongside groups from all over the UK. It was particularly satisfying to be chosen to end the proceedings – even though that meant that we had plenty of time to get nervous! As ever, the actors and musicians did us proud, bringing the curtain down on a memorable evening to mark the end of the Open Stages project. As for Macbeth three years earlier, we were invited to perform extracts from our production of Falstaff at the Courtyard Theatre in Stratford. 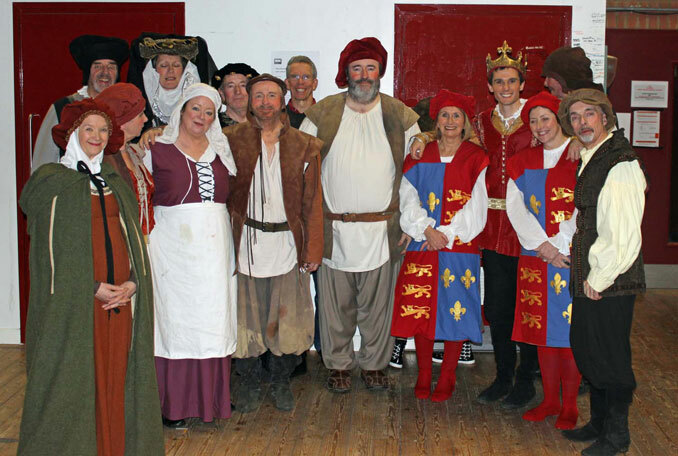 The first extract found Falstaff and his cronies - including the young Prince Hal - enjoying themselves in Mistress Quickly’s tavern. In the second extract, Falstaff and his friends are drinking when they hear the news that their former companion Hal has become king. We knew that some companies would be invited to perform at a showcase in Stratford, so it was with bated breath that we welcomed one of the Open Stages team to a performance of Macbeth. We heard that we were through to the 'finals' in early December and six weeks later the RSC asked us for a seven-minute compilation of key moments between Macbeth and Lady Macbeth. We had a short wish-list for the RSC ― real candles, a hazer (fog-machine), and the ability to put Macbeth in the circle for 'Tomorrow and tomorrow and tomorrow...'. The RSC staff were incredibly helpful and couldn't do enough for us. It was fascinating to see the vast range of work on offer, and to compare our own performance with those of other groups.